Just a note saying that the first three books have been re-released in one edition called The Chronicles of the Black Company, partly due to the books popularity with soldiers in Afghanistan and Iraq. I'm guessing it's likely they can relate to the men of the Black Company? I highly recommend reading the first three books of this series, and if you enjoy them, the rest will continue and also fill-in the background some. These three are called The Books of the North & are also sometimes referred to as The Annals of the Black Company. These three books are available as a single three-book hardbound edition under that name that name (regularly listed on ebaY - advanced search under 'Books' for 'Glen Cook'). I will say here that the first two chapters of the first book, The Black Company, is kind of hard starting as the nicknames of some of the major characters are thrown out rather quickly. This has turned some people off from continuing to read them, but in a way, its sort of a 'weeding out' of those who aren't worthy of joining the company. If you stay with it and get to chapter 3 (titled Raker), you wont be sorry. That chapter was a short in Sci-fi & Fantasy magazine in the early eighties and really gets the story going. If you do start with chapter 3, you can always go back and read the first two chapters as a sort of prequel if you wish. A note on the chapters in the first book... they are huge! Take the breaks when the story shifts a little, or where the little three stars appear. The first three books start with the Black Company taking on a new contract with the Empire, and they board ship to head north. Along the way they have to battle a rebellion against the empire, and in finally coming to the city of Charm, the capital of the Empire, they are faced with much more than they ever expected. There is alot of good battle descriptions and sorcery along the way! Written as a journal for a common soldier, it's an excellent book that takes place not long after the events covered in the White Rose. An evil power mentioned in the earlier books attempts to rise again. I think its one of the better reads of the series. There are seven members of the Company left, and its a hard time for the Company. Shadow Games starts off with the remaining members deciding their course of action since they have no comission binding them. This begins their journey south, and into all they encounter & what they get mixed up in along the way. 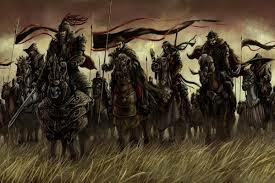 As they travel further south, we are introduced to the Shadowmasters who fear the Black Company's coming. After stopping and resting in a city where they meet the Nar, much political intrigue, alliances, and army-building, there come a climatic battle with the Shadowmasters. Dreams of Steel continues from the aftermath of this battle, and is the first actual Black Company book written from a different member's point of view. The writing style reflects this as it has a distinctively different feel, which is a great feat for an author to do in my opinion. The end of Dreams of Steel leaves the story as somewhat of a cliffhanger leaving the reader wanting to know what happens next. The account in Bleak Seasons is of the perspective of the standard-bearer Murgan, who we are introduced to in Shadow Games. This account parallels some of the events mentioned in Dreams of Steel and is again, written a bit different to reflect a different character's perception. She Is The Darkness gets us back to the perspective of the Black Company annalist, and covers all he had been through since the end of Shadow Games, so it too runs somewhat concurrent with accounts in the previous two books. The writing style is similar to the early books, though the last couple chapters I noticed the story got a little choppy and hurried. It seemed Glen Cook may had let it sit for a time, and then hurried to finish it to maybe meet a deadline. The story worked ok, but I thought it could have used maybe another chapter to smooth it out some. Water Sleeps, and Soldiers Live continue the Glittering Plain adventures after a number of years, aging the characters and closes out stories of many of them. Some new folk are introduced but not really developed, and it leaves open the door for more books in the future me thinks [small](in this interview with Glen Cook he says there may be a couple more Black Company series books coming in a few years)[/small]. As a series, you can feel the morphing of the story through the years it took Glen Cook to write them, and it follows well in the aging of the characters in the story. I do think he dwells too long on some things that in my opinion really didn't require so much verbiage, and he doesn't go far enough in depth into things I found intriguing, but that's also the way it is with me and J.R.R. Tolkien's writings. Yes, the Black Company is quite a dark story for sure. One of the things I liked about it was the way the battles were described. Not outrageously descriptive, but it conveys a feeling a common soldier may have for their fallen friends and comrades. Also, some of the more developed characters seem 'real', and the composition of the Black Company at any one time is filled with 'everyman' types from all walks of life. I'm surprised this series isn't more popular, but I guess it takes a grim sort of person to understand it. If you're looking for the typical fantasy 'happily ever after' story, this is not for you. But if an 'in the trenches' grit is looked for, I highly recommend reading this series. Here are the book covers of most of the books. I found a Black Company Livejournal Community here. About the cardgame Tonk the men are said to be playing at various times... its a gambling card game played in the Black Company books based on the rummy game of the same name. Here are the rules if anyone is interested in it. I had the opportunity to play this game a year or so ago with several people, and it was quite fun! This review is a good one on the first book. I have to agree with his final statement where he says not to read it if you're looking for a Tolkien derivative. I guess because its so different from Tolkien is why I like it. This review speaks well of the book too. This Review gives some comparison to other popular authors. Last edited by Hanasian on January 29th, 2014, 12:59 pm, edited 1 time in total. After struggling through the second Scott Lynch Lamora book Red Seas Under Red Skies, I needed something with grit so I'm re-reading this series. I forgot how good Chapter Three of The Black Company was! Woo-eff'n-HOO! A new Black Company book is coming out! Wait, two of them. One this month called The Return of the Black Company, and another early next year called The Many Deaths of the Black Company. Rumour has it this last one will close the series at 12 books! I have to say this is probably one of the best book seires ever! I'm in the middle of Bleak Seasons right now. I have to say this is probably one of the best book series ever! I'm in the middle of Bleak Seasons right now. It is pretty darn good! I'm in the middle of Bleak Seasons right now in my lazy re-read of the series! And never mind the "new" books I mentioned. The series has been re-released with slightly different titles for the 4 combined books. Again quite popular with the troops in Afghanistan & Iraq. I have to be one of the worlds slowest reader! I'm just now wrapping up my re-read through this fine 10-book series. Its like a Dirty Dozen meets Lord of the Rings mash-up! If handled properly, it would make a great mini-series in the vein of the Ice & Fire one. Looking forward to a new book in this series coming sometime this decade. I'll be curious how the writing style will change due to the years since the Soldiers Live was written. has no business poking around in an alien soul." Actually... I don't think Glen Cook will ever get around to writing another Black Company book. Ten Books.. Ten Who Were Taken.... Not sure where he could take it from where it left off at the end of Soldiers Live. The beloved old characters that remained had aged a lot, and with the exception of Lady who can seem to re-invent herself with the limited magic she had regained, I'm not sure where it could go. The two sister minor wizards they befriended in the last book could have potential, but who knows.. Glen doesn't seem to be too much into writing any more of the series despite rumours to the contrary. Edit: Yes! It looks like a TV miniseries is moving forth! Hoping they get this right! Nice review, Hanasian. I'll have to check it out. I does ring bells, but I don't think I've read the series. It's not for everybody. Reviews on Goodreads have people either loving them, or hating them. And now, a new book called Port of Shadows. I understand this one slots itself between the 1st book (Black Company) and the 2nd book (Shadows Linger).